This symposium celebrates the significant roles women have played and continue to achieve, in preserving historic sites. Numerous iconic historic buildings and neighborhoods owe their very existence to the determination of women to preserve them. This was achieved by building awareness, securing private philanthropy, and fighting to establish public policy. Women have led the historic preservation movement from its earliest efforts until today. Speakers from across the country will come together for a symposium to explore and contextualize these achievements. Six presentations will consider various women’s contributions to historic preservation from the founding effort to preserve Mount Vernon, to Colonial Williamsburg, the White House, and historic neighborhoods in Richmond, including contemporary concerns in preserving Richmond’s more troubling past. 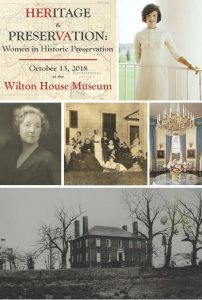 This daylong symposium is in celebration of the 125th anniversary of the founding of women’s organization that saved and restored Wilton, The National Society of The Colonial Dames of America in the Commonwealth of Virginia. This talk will root the American historic preservation movement in the tremendous efforts of nineteenth-century women. By collecting, researching, arranging, and preserving the past, these pioneers ensured the survival of the nation’s material heritage while actively shaping contemporary conversations about identity. Susan Higginson Nash was Colonial Williamsburg’s first decorating consultant, responsible for the creation of historically accurate color and furnishing schemes that would go on to delight and inspire the nation. While an all-male Advisory Committee of Architects oversaw the progress of the architectural and landscape restoration work in the 1930s, Nash, the only woman working in the architects’ office, oversaw a Ladies Advisory Committee that played an important role in guiding the decision-making process, particularly regarding interior colors, décor and furnishings. Decades before architectural paint research was a recognized discipline, Nash understood the significance of architectural color and worked tirelessly to bring Williamsburg’s 18th-century settings to life through documentary research, extensive fieldwork, and artistic experimentation. Her pioneering efforts laid the groundwork for Williamsburg’s continued focus on architectural paint research. James Archer Abbott will identify America’s one-time “New Frontier” first lady as an influential and pivotal player in the shaping of modern preservation theory and practice. Formally beginning with her behind-the-scenes contributions to her husband John F. Kennedy’s Pulitzer-prize winning “Profiles in Courage,” Abbott will identify history as Jacqueline Bouvier Kennedy’s language of choice. Once her husband became President of the United States, Mrs. Kennedy made restoration and preservation national interests, as opposed to regional or community fascinations. Her somewhat theatrical transformation of the White House – classified as a “restoration” – became a visual moniker for a burgeoning national preservation dialogue that culminated with the now iconic saving of early-19th century houses surrounding Washington D.C.’s Lafayette Square. After the White House, and largely through a carefully crafted memorialization of her martyred husband, Kennedy proved instrumental as an activist and contributor to the saving of some of the nation’s greatest architectural and historic treasures. In the 1950s a tight-knit group of Richmond ladies joined forces to rescue the decaying neighborhood in the vicinity of historic St. John’s Episcopal Church. Brilliantly, they combined knowledge of how cities function, common sense, unique tactics, and considerable moxie to create one of our nation’s most evocative mixed-use neighborhoods. Across the Commonwealth of Virginia various efforts by women are re-shaping our cultural landscape and our understanding and appreciation of Virginia history. African American women have been and continue to be a quiet force in the preservation of historic sites that have fostered communities of uplift. This presentation will provide an overview of contemporary African American women and their activism and endeavors in the field of historic preservation across Virginia.